Today I will show you how to freeze all that Zucchini from your garden for baking Zucchini breads and muffins all year long! All squash gets quite watery and can even be mushy after freezing. The key to success in freezing it for baking is to draw as much of the water out of it before freezing it as possible. That way ,it won't release too much water in your recipes. I'll show you how to have the best results possible. Some directions will have you partially steaming your zucchini to draw the water out, but I don't want mine partially cooked, so I will show you an easy step that will still retain that fresh picked flavor. Shred your zucchini. I don't bother to peel mine, but you are welcome to prior to shredding. In a mixing bowl, lightly mix about one teaspoon salt per pound. (approximately one large zucchini, or two medium). Let zucchini set for about 10 minutes. This will allow the salt to draw out the water. 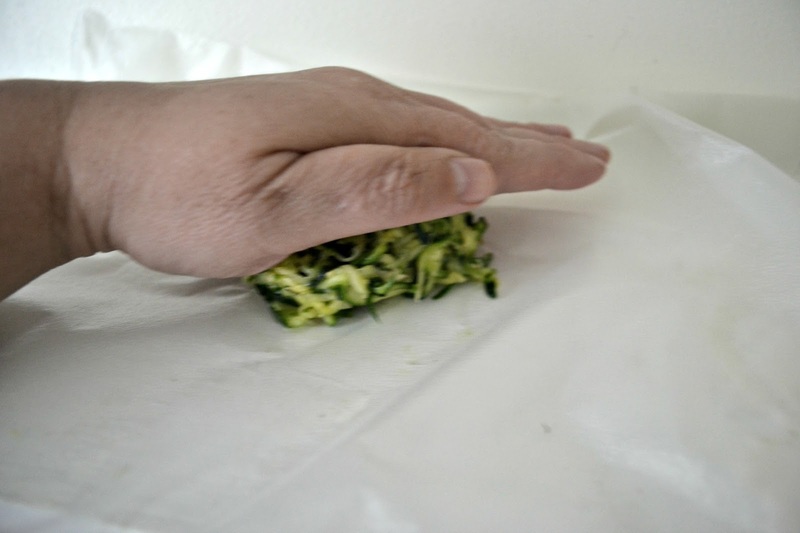 Scoop up a large heaping handful of zucchini and place inside the cloth or towel. Twist the towel over the zucchini to form a ball. 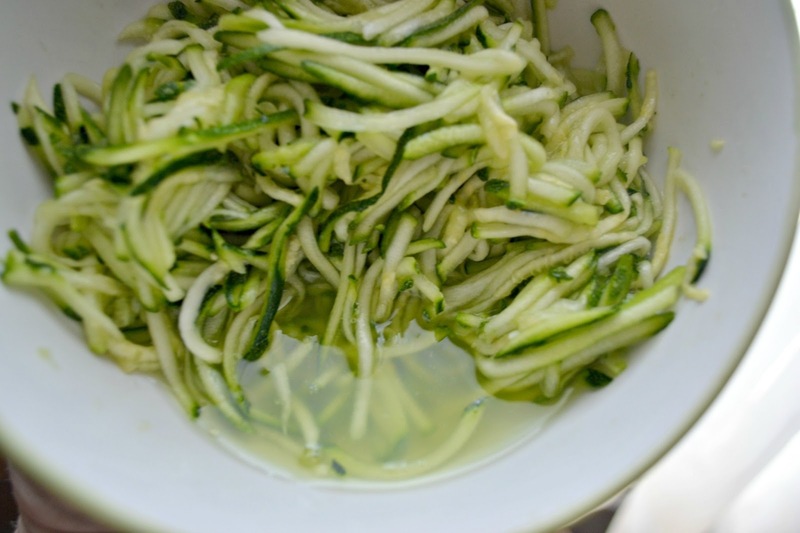 Squeeze the zucchini over the bowl or sink to release as much water as possible. Place squeezed zucchini in a separate mixing bowl. Continue with remaining salted zucchini. 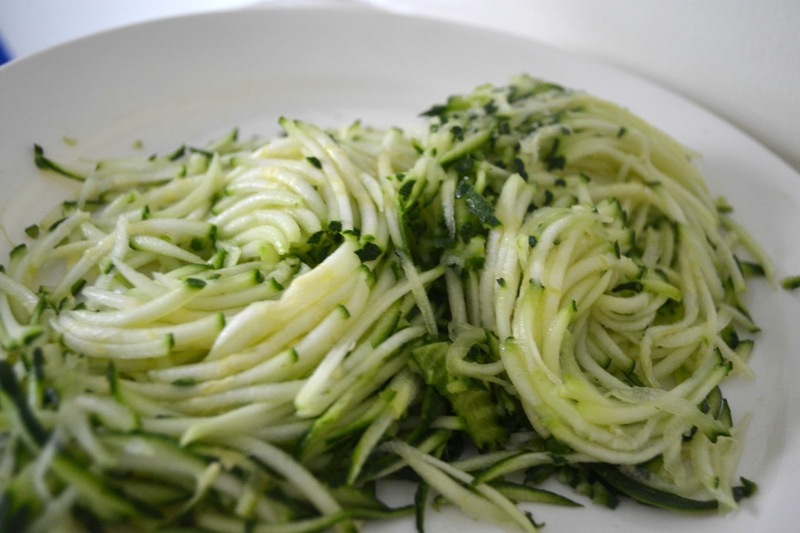 Using a one cup measure (or more/less per your preference) pack shredded zucchini till full. Turn the measuring cup over onto a large square of plastic wrap ,large squares of recycled wax cereal bag liners, or press and seal wrap. 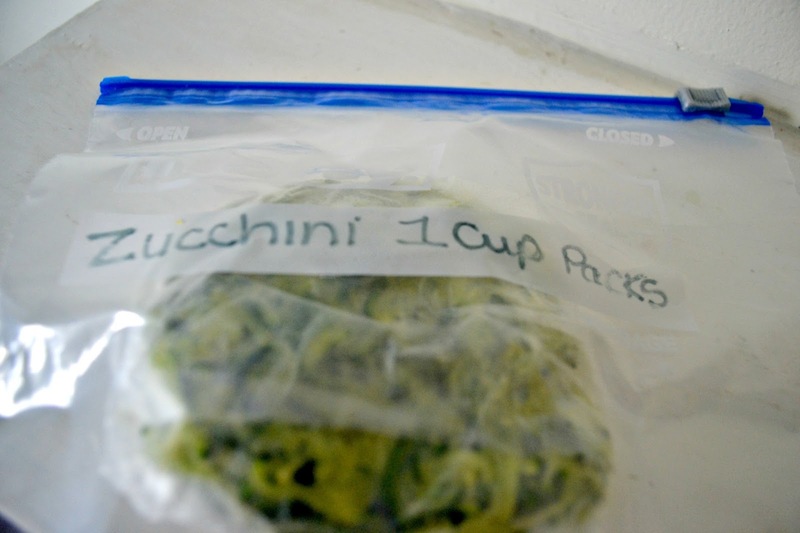 Press down on the mound of zucchini to form a flattened "patty"
Place all of your sealed, one cup patties into a freezer bag or airtight container and label with name, date and measuring amount. 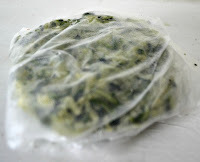 To use, just pull out needed amount and thaw. then it is ready to mix into your baking. I freeze shredded zucchini also! I don't use salt, however,and once the zucchini is frozen I store them in vacuum bags with my Food Saver (aka my sucky machine!) It will be nice to use the zucchini in the winter to bake muffins and zucchini bread! I have had the worst luck with food saver machines! They keep breaking on me so I have given up! I love them when they work though! I have also had really bad luck with freezing zucchini-and with my foodsaver machine (stupid thing only works half the time, I got a bum model, need a new one). I can't wait to try this method. linking up through frugal by choice for homemade Monday! Jennifer (Love that name, it's my daughters name too!) I am glad you found me! Let me know how it goes if you give it a try. Best of luck w/ a new food saver! Great tutorial, I did not know you could freeze zucchini. Thank you. I agree with Shawna... do you know of other veggies that this method would work for?? Thanks!! 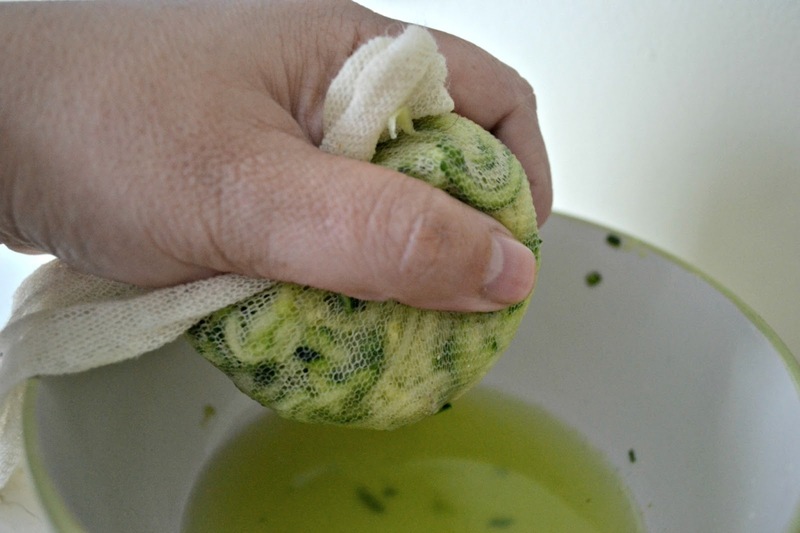 Melissa, this method really works best forr any squash, summer squash, Patty Pan etc. (although squash in general has too high a water content to thaw and not get mushy for any other kind of recipe than baking. But you can easily sneak some yellow squash, pattypan, etc into your baking, the family will never know its' there, and you get a little added nutrition in them! What a great tip, thanks! I wonder if the squeezed-out water is nutritious enough to freeze for later use, like cooking vegetables, adding to soups or stews, etc? It would be perfect for that! Just remember there will be some salt in it, so keep that in mind when using it for vegetable stock. Excellent tips! I usually just give away the extras. Now I'll freeze them. Thanks for sharing at the Creative Home & Garden Hop. Looking forward to seeing what you share this week. Thanks for the tip! One question though, when you go to use the zucchini later in a baking recipe would you need to adjust the amount of salt in the recipe? 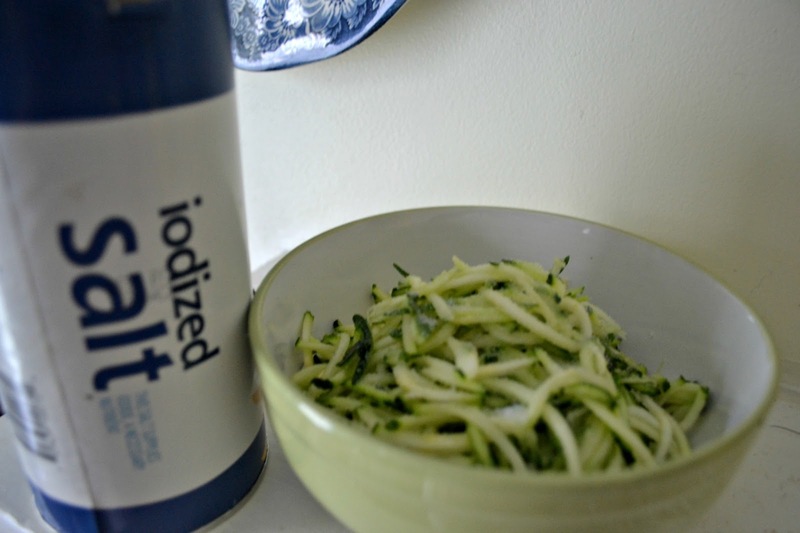 I usually completely eliminate the salt listed in the recipe when I use my freezer zucchini, but leave the salt in of course if I am grating and using fresh zucchini in the recipe instead. Thanks so much. I had been modifying my recipes to account for my watery zucc. with mixed results. Using cereal bags instead of parchment paper... brilliant! I have so many ways to use that. That's a LOT of zucchini! He'll be enjoying your Zucchini breads/muffins all winter long! I'm very new to freezing. So if a recipe calls for 2 cups of zucchini, is it still 2 cups of wrung out frozen zucchini? Sorry for the delay in answering, I am getting my son off to college today! I premeasure the 2 cups prior to freezing and then just dump that into the recipe after it is thawed, even if frozen has shruken it smaller, I use the "pre-frozen" measurement. Hope that helps. Thanks! I will do that with the next batch. Great tips. We got more than 300 zucchinis varying in size. Been supplying half the town & then some. Now I need to freeze the remaining for bread.